Isthmic spondylolisthesis starts with a crack in one of the vertebrae, usually at the point at which the lower (lumbar) part of the spine joins the tailbone (sacrum). It may develop as a stress fracture. Because of the constant forces the low back experiences, this fracture does not usually heal as normal bone. 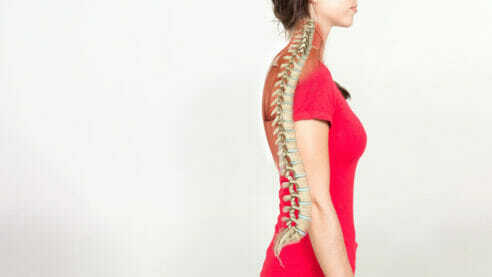 In some cases, the cracked vertebra slips forward over the vertebra below it. Degenerative spondylolisthesis starts with wear and tear on the spinal vertebrae that can happen with age. Over time, the vertebrae – and the joints and ligaments that hold them in place – can become weak and slip out of alignment. Degenerative spondylolisthesis is a common reason for buttock and leg pain and can lead to spinal stenosis. Standing, walking, and other activities tend to make symptoms worse, while rest will provide temporary relief. Studies have shown that 5 to 10 percent of patients seeing a spine specialist for low back pain will have either a spondylosis or isthmic spondylolisthesis. However, because isthmic spondylolisthesis is not always painful, the presence of a crack (spondylosis) and slip (spondylolisthesis) on the X-ray image does not mean that this is the source of your symptoms. Your doctor will begin by taking a history and performing a physical examination, and may order X-ray studies of your back. However, sometimes it is difficult to see a crack and/or slippage on an X-ray image, so additional diagnostic imaging may be needed. A computed tomography (CT) scan can show a crack or defect in the bone more clearly. A magnetic resonance imaging (MRI) scan may be ordered to clearly show the soft tissue structures of the spine (including the nerves and discs between the vertebrae). It also will show whether the fracture is recent and whether any of the nearby discs have suffered any wear and tear because of the spondylolisthesis. How is spondylolisthesis treated nonsurgically? If a combination of medication and therapy fails to provide relief, however, your doctor may order additional tests, which will provide greater detail so he/she can plan further treatment. What are the surgical treatment options for spondylolisthesis? If conservative treatments do not work, surgery may be considered. Surgery is reserved only for the cases where everything else has been tried or the pain is so severe that you cannot do the most basic of daily activities.